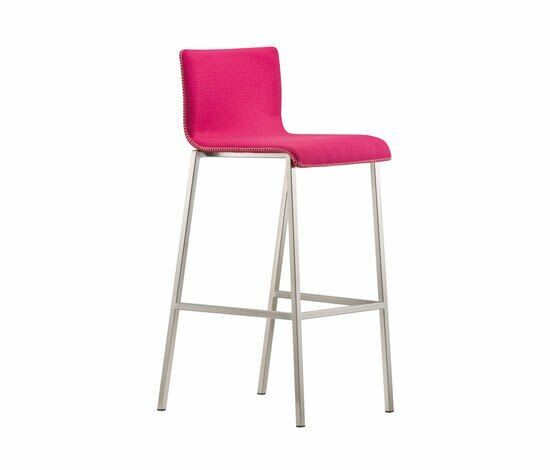 Kuadra barstool, fabric seat covering, visibile “chains” stitches. Chromed or satinized steel tube frame 20x20 mm or chromed steel tube frame Ø16 mm. Two heights available: 650 mm or 800 mm. Kuadra chair family with shell available in technopolymer, nylon, polycarbonate, genuine or regenerated leather, multilayer veneered bleached oak, wengé stained, ebony, zebrano or upholstered. Frame versions: steel tube Ø mm 16 or mm 20x20 or steel rod Ø mm 10. Kuadra stools, multilayer veneered shell available in bleached oak, stained wengè, ebony or zebrano finishes, horizontal grains. Chromed or satinized steel tube frame, round or square version. Available heights: 650 mm stackable or 800 mm. Central base and plastic shell versions available.